Please note: There is an official guide to the disposal of sharps, such as needles or syringes – available on the Government of Western Australia Department of Health Website. So please do not treat this article as a general guide. All sharps found are to be treated with extreme care – It is estimated that in 2015, over 850,000 people were injured by an incorrectly disposed sharp in the USA. If you come across a used sharp, do not panic. Find a puncture resistant, plastic container that has a screw-on/off lid. Avoid using glass or thin plastic which might shatter / puncture. Avoid plastic bags, as they might cause injury to an unknowing person after you dispose of the sharp. Use gloves if possible, and pick up the sharp by the blunt-end, and place it needle first into the container. Tightly seal the container, and dispose of it in a domestic rubbish bin or sharps disposal unit. Do not dispose of the sharp down a toilet, sink, recycling bin or any other unsafe place. 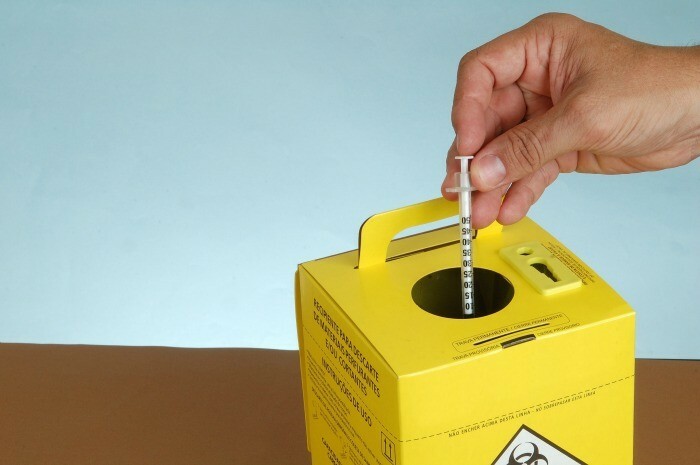 Are you a business looking for a sharps disposal box for your premises? Envirocare Systems has provided a Sharps disposal service to Perth businesses for over 16 years. Installation and maintenance of a shatter and theft proof, fixed sharps disposal unit in a location of your choice. Regular servicing and emptying of the sharps disposal unit, so that you don’t have to worry about your employees or customers potentially injuring themselves. Click here to learn more about the Envirocare Systems sharps disposal service.